72 y/o female with IDDM who presented with significant cataract, vitreous hemorrhage, and a tractional and rhegmatogenous retinal detachment with sub retinal blood by B-scan ultrasound. Visual acuity was HM. She underwent combined phacoemulsification with P/C IOL, 25g pars plana vitrectomy with silicone oil tamponade. 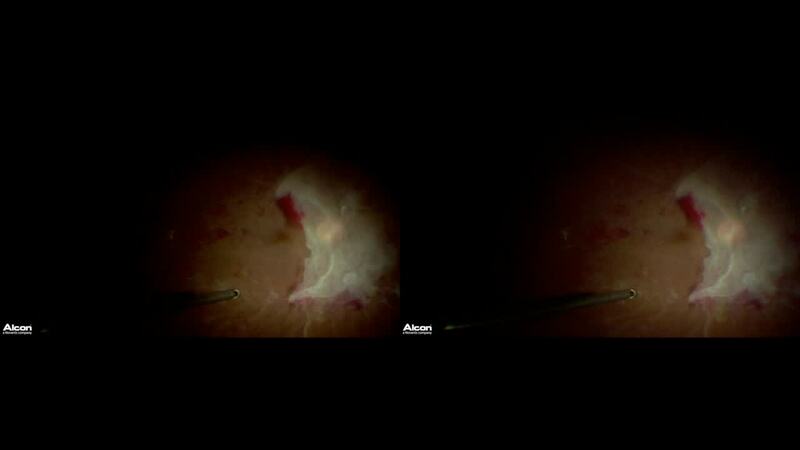 During the surgery sub-retinal membranes were seen which were removed with forceps through retinal breaks. A large pool of sub-retinal blood over the posterior pole was displaced with proportional reflux with the vitrector and displaced towards the periphery with liquid per fluorocarbon injection and aspirated through the breaks. Postoperative visual acuity at 3 months was 20/400.